As an Internet enthusiast, I encourage children and young people to enjoy (age appropriate) technology and I provide lessons on digital citizenship so that they can use technology and the Internet in a responsible manner. Despite these precautions, it is inevitable that something inappropriate will happen. While I sincerely hope that the degree of the incident is minor and nothing more than a few comments like your “backpack is ugly”, it is possible that someone may post something hateful, threatening or really rude about your child. Social networking sites have legal teams that work to protect you and your child. These child safety teams have created rules that people must adhere to and they have put reporting mechanisms in place to help enforce those rules. Take a peek at the help centers of Twitter, Facebook, Instagram, Ask.fm and Pinterest, to give you some examples. 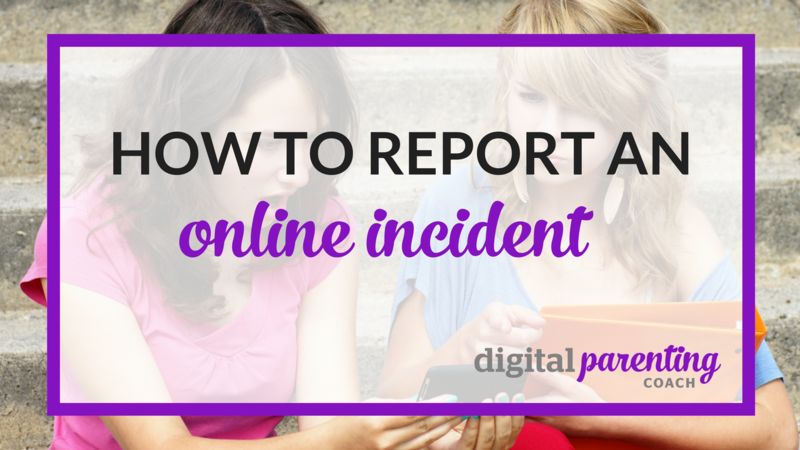 In the event that something happens online: either your child sees something inappropriate or someone on a social media site is making your child uncomfortable, use the reporting mechanisms that are available. And take advantage of the support groups, helplines and hotlines that may be available in your country. Screenshots (document everything, comments, pictures, posts, etc. IcanHelpline: is a new social media helpline for schools in California and also has a fantastic page for emergency helplines and hotlines for a range of issues across the country. Cyber Tip: is a helpline run by the Canadian Centre for Child Protection: is a registered charitable organization dedicated to the personal safety of all children. Netecoute.fr: 0800 200 000 is a free, anonymous and confidential number available 9:00-19:00 during the week. A hotline is staffed by counselors available to speak to parents, teachers, students, children – anyone with an online issue. The free consultation is available via email, chat, Skype, or telephone. e-enfance: created in 2005 in France, e-enfance is a non-profit organisation, working in the field of children’s and young people safety on the Internet, mobile, video games. Internet Sans Crainte: a government project created in France as part of the European Safer Internet Plus project and has been in operation since 2005, under the remit of the Ministry of Higher Education and Research and the Secretariat of State for the Digital Economy. ChildLine: 0800 111 is a free 24/7 helpline for children and young people. ChildLine is run by the National Society for the Prevention of Cruelty to Children (NSPCC). Internet Watch Foundation is the UK hotline for reporting child sexual abuse content hosted anywhere in the world, criminally obscene adult content hosted in the UK, and non-photographic child sexual abuse images hosted in the UK. If you are in another European country, you can find your local helplines and hotlines on this listing available through the Better Internet for Kids portal, developed by European Schoolnet. Portions of this post first appeared in Inspirelle.com.